Real deal tapas from Philadelphia's Iron Chef. 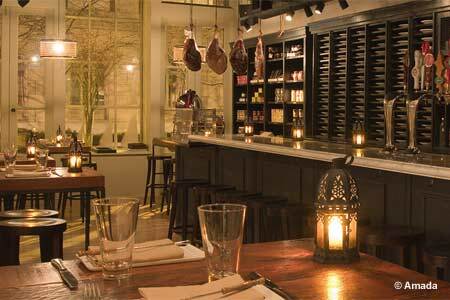 : Philly's own Iron Chef Jose Garces brings tapas to Philadelphia in a comfortable, rustic restaurant hung with hams and sausages. Start with a designer cocktail in the atmospheric bar, sip house-made red and white sangría or vin from Spain or Chile. Plates of tapas --- think octopus, garlic shrimp, cured meats, Cabrales cheese and figs, ham croquettes and olives --- are as pretty to look at as they are satisfying to eat. If you want the full experience, book a table in the large, wraparound dining area served by a bustling open kitchen. Lobster paella is a house specialty, served for two, or try the grilled meats and seafood. If you plan in advance, a whole roasted pig with all the trimmings feeds a party of four or more. At lunch, the two-course $15.50 "Catalan Express” with a choice of soup followed by a salad or sandwich is a good deal.